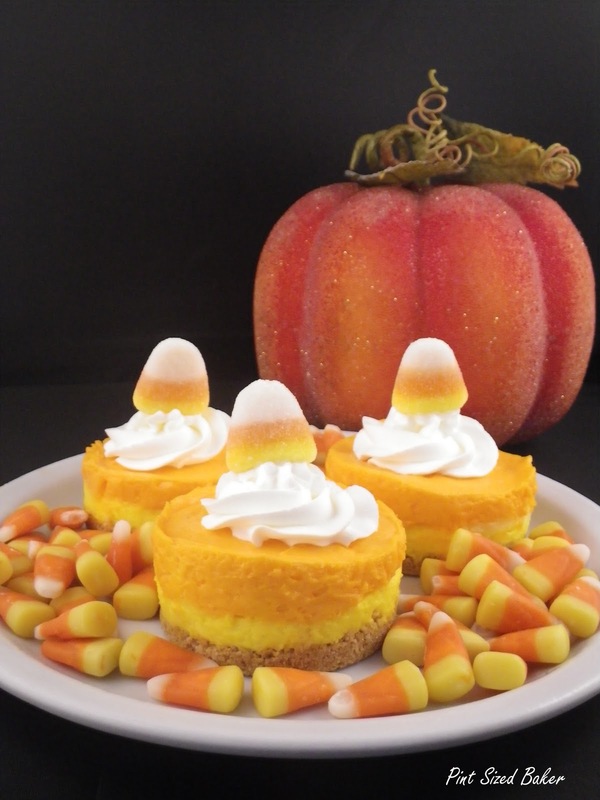 I was so inspired when I saw these Cheesecakes! Incredible! Wonderful! Stunning! I soooo wanted to make them! I found the pans online, but then looked around locally for them. Yeah, not so easy when you local shopping centers consist of Kohl’s and Wal-Mart. I had to venture out to the city! Over the hills and through the woods (literally) to the Outlet Mall. I found my pan at a Corningware store. They have little disks that pop out of the bottoms so you just push the disk up and remove them from the pan. It wasn’t as easy as it seems because my fingers are short and they are tall. I did have to smooth out a few fingerprints from the sides. But, it still worked great! So for my first test run, I went and made some Jell-O No Bake Cheesecake mix. Yes, from the box (eek!) – you know- for testing purposes. Wouldn’t want to waste good cream cheese. From the box mix I got 6 pint sized cheesecakes. I followed the directions and then split the batter in half and colored one yellow and one orange. Added the layers, set in the fridge, and whipped some cream to top it off. NEXT time, I’ll make the real deal and see how it goes. I’ll use more filling – to me, these look a bit stumpy. I want to try different flavors and colors. I am so excited to make some cheesecake treats! FYI – those Gummy Candy Corns on top were GROSS! I spit them out! Even the kids did not like them! Blech! But at least they looked pretty for the picture. I'd been waiting to see since you posted your pic of the pan last night on FB…so the difference is just coloring, not flavor then? Very clever…..now lets see the 'real thing'!!! Dominique – Yeah, just one flavor. I was just playing round with the new pan. Wanted to at least make something that looked fun 🙂 Thanks for visiting. Too cute!!! Thank you for visiting my site.